Cecil Reid was back with us again this year, traveling all the way from Forest City, NC with his two daughters to participate in the tournament. He was the oldest male golfer and also the person traveling the furthest for the tournament. Thank you, Cecil, for your wonderful GiveBack to the Cando/Towner County area! We were happy to welcome back a Team of Classmates - Class of 1966 - to our tournament again! Many thanks to Greg and Jan Westlind for sponsoring the team of Jeanette LaRock, Bill Steele, and Greg Westlind. Here they are visiting with another classmate, Tim Learned. Impact Foundation and Dakota Medical Foundation for their support throughout the year and for our tournament. To all of the board, members, grounds crew, staff and volunteers at the Cando Golf Course - thank you for providing a beautiful course, lovely gathering space, many of the golf carts, and welcoming atmosphere. To R.J., Katie, and Kathy Miller from The Q Restaurant - thank you for your special efforts in serving up a wonderful dinner. A special thanks to Donna Huschle for her generous volunteer hours on the day before and the day of our tournament - we really appreciate your efforts! Our sincere thanks to Lavonne Haugen and Jill Eggl, Impact-Cando Connection Fund Advisory Board Member, who graciously shared their expert photography skills to capture the fun and excitement of our 11th Annual event in Cando. Our tournament was a success because of all of your GiveBack! Cindy Eggl, Advisory Board Member, along with Donna Huschle and Jan Eggl welcoming back the team of Jordan Houle, Lucas Holien, Jeff Sivertson, who have played in all 11 tournaments, and their teammate, Andy Gullicks, to the tournament. 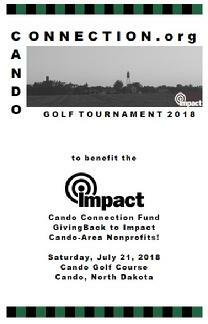 We were so proud to host our 11th Annual Impact-Cando Connection Golf Tournament! Our sincere thanks to all the individuals, families, businesses and organizations who have chosen to participate in this charitable opportunity to GiveBack to the Cando/Towner County area. With over $214,000 raised, over $165,000 granted back through 100 grants to 18 different charitable organizations, together we have truly had an impact - thank you!